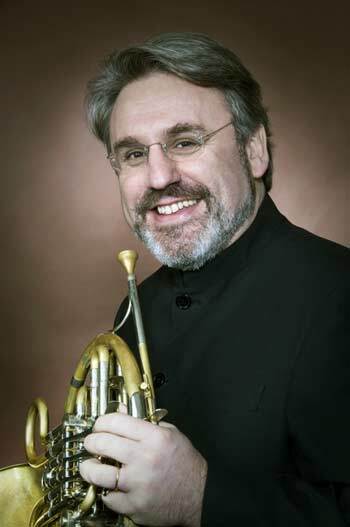 Radovan Vlatković (born 1962) is widely considered to be one of the world's most exceptional horn players. He grew up in Zagreb, Croatia and studied with Prerad Detiček at the Zagreb Academy of Music and Michael Höltzel at the Music Academy in Detmold, Germany. He was principal horn of the Berlin Radio Symphony Orchestra (1982-1990), a post he left to devote himself to a solo career. He has been professor of horn at the Mozarteum in Salzburg, Austria since 1998 and also teaches at the Escuela Superior de Musica Reina Sofia in Madrid. Radovan is a senior artist at the Marlboro Music Festival and has performed in chamber music and solo recitals for the Philadelphia Chamber Music Society. As a student Radovan already won prizes at the International Horn Competition in Liége, Belgium, at the 12th Yugoslavian Music Competition, and at the International Competition "Premo Ancona" in Italy. Especially noteworthy was First Prize at the ARD International Competition in Munich in 1983; the prize had not been awarded to a horn player in 14 years. As soloist Radovan has travelled most of the European continent, America, Canada, Mexico, Israel, the Near East, East Africa, Japan, and Australia. Among his appearances he played with the Radio Symphony Orchestra of Berlin, the Bavarian Radio Philharmonic, the BBC Symphony Orchestra London, English Chamber Orchestra, Academy of Saint Martin in the Fields, Camerata Academica des Mozarteums, in Japan with the Yomiuri Symphony Orchestra, Tokyo Metropolitan Orchestra, and the NHK Symphony Orchestra, and at IHS symposiums. He was Artistic Director of the September Chamber Music Festival in Maribor, Slovenia (2000-2003). Radovan has an especially wide repertoire, reaching from the Ba roque to the 20th century. He has recorded for EMI Classics, with the English Chamber Orchestra under Jeffrey Tate, all the concertos by Mozart and Strauss. His recording of the Mozart concertos was awarded the German Recording Critics Prize. He received the Croatian Porin Award for his Life's Work in 2012 and the IHS Honorary Membership in 2013.